Looking for Hostgator promo codes and coupons? #MasterTheWeb and save money today with our exclusive The Webmaster offers. This offer with our exclusive promo code provides 60% off all Hostgator shared hosting plans. The discount applies to the first term, and first invoice only. 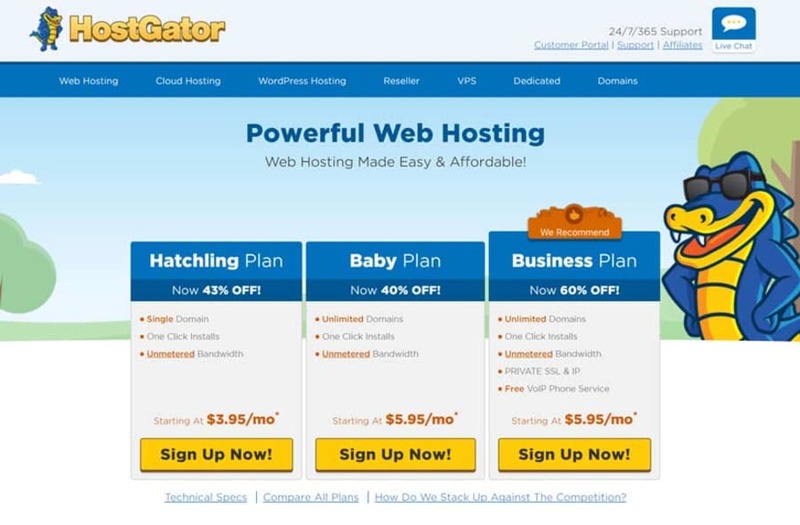 Get up to 57% Off with Hostgator WordPress Cloud Hosting Business Plan. Alternatively, you can get 40% off their Starter PLan or 50% off their Standard Plan. Get 58% off the Silver Reseller Hosting Plan, 41% off the Copper Plan, and 33% off the Aluminium plan. Includes Unlimited domains, cPanel, WHM and WHMCS client management \ billing software. HostGator Reseller Hosting plans are perfect for those looking to run theirr own web business. Get 75% off Hostgator VPS plans. 2GB Ram, 2 CPU Cores, 120GB Disk Space and 1.5TB Bandwidth from just $19.95 per month. Get up to 48% OFF Hostgator Dedicated Hosting Servers. Get a 4 CPU core, 8 GB RAM and 1TB HDD for just $119 per month. This is our Standard Hostgator Coupon which gives $9.94 off the first invoice and is suitable for those who choose to pay monthly. Essentially, you get a month of web hosting for 1 cent. Get up to 45 % OFF Hostgator Shared Cloud Hosting Plans. Starts at just $4.95 per month. When you click one of the HostGator coupons above a box will pop up with the code, which you can then copy to your clipboard by clicking the “copy” button. Once you have copied the code, click “Continue to HostGator” to be taken to the relevant page on the website in order to choose your HostGator plan. Our step by step guide takes you through the process of signing up for the shared website hosting type. Once you have clicked to view HostGators Shared web hosting plans you will need to select the one you wish to purchase. 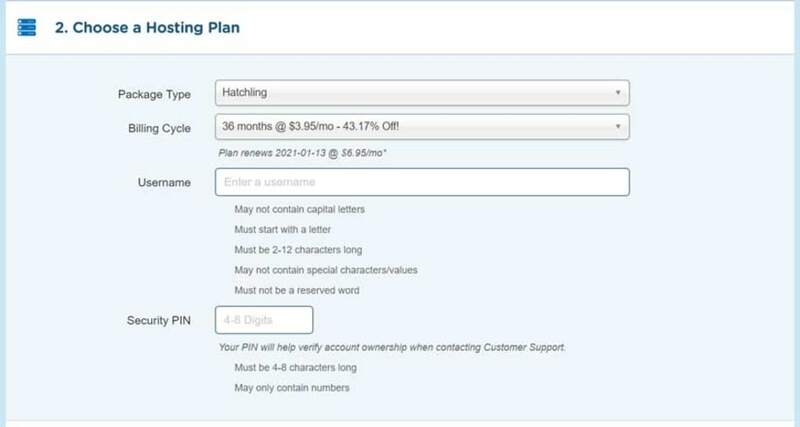 If you only ever intend to host one simple blogging website, then you can select the Hatchling plan. Otherwise, the HostGator Baby plan allows unlimited websites. If you require better performance, including failover, or want to supercharge your WordPress website then you may wish to consider Hostgator Cloud, or their Managed WordPress Plans (also based on their Cloud technology). If you will be running a e-commerce then you should choose the Business Plan which comes with a free dedicated IP and Free SSL certificate. For a full overview of the different web hosting packages see our detailed review. The next step is to select your domain. If required you can register a new domain, although I recommend buying your domain separately (see this guide). They also allow you to do a domain transfer of any existing domain you own at this stage. Choose a Hosting Plan, Billing Cycle, Username & Pin. This section shows the plan previously selected, but you can change it here if you wish. You must also select the billing cycle, and you will see the respective discounts next to each one. You will add the coupon code a little later, but if you want to see updated pricing now, scroll down and enter the code. Any discounts only apply to the initial billing period. You will see that the discount amounts are updated in the Billing Cycle box. Choose a Hosting Plan, Billing Cycle, Username & Pin. © The Webmaster. 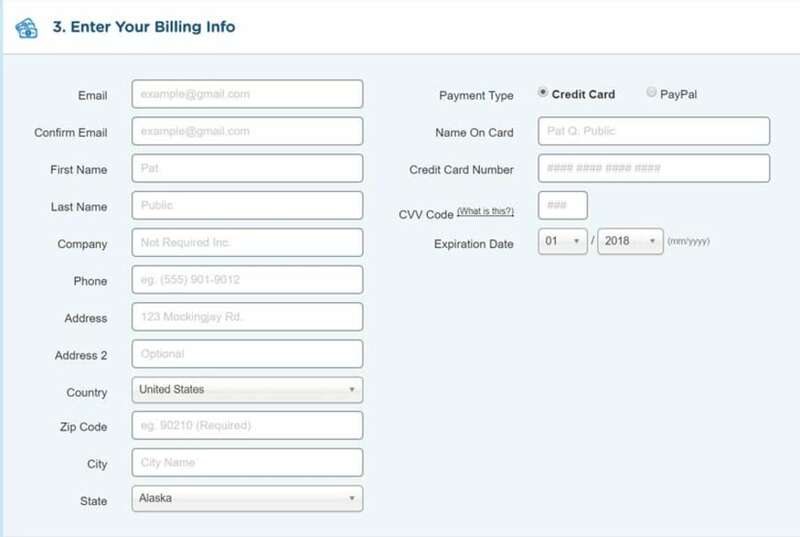 Enter your billing information. You can pay via credit card or PayPal here. You can pay by other methods such as Cheque, Money Order or Cash, but you should contact support on how and where to send these. Enter billing information. © The Webmaster. SiteLock Monitoring - This is a monitoring service that checks your website daily and immediately notifies you if your website has been hacked or injected with malicious code. Professional Email - This is powered by Google. We highly recommend this service, but recommend you sign up directly with Google if you are interested. You can get a 14 day FREE TRIAL here. Site Backup - We highly recommend backing up your website with a third-party backup service. CodeGuard is a reputable service, but you may wish to also consider VaultPress if you use WordPress (although this is slightly more expensive). Add Additional Services. © The Webmaster. Paste the code you copied from the coupon above into the box and press validate. You should see all the pricing update. Enter HostGator Promo Code. © The Webmaster. The final task is to review the order details. Pay particular attention to the pricing to ensure the full discount is applied. Review and complete order. © The Webmaster. Without knowing your website, and how many visitors it gets it is difficult to provide specific advice. For shared web hosting, their Hatchling plan only allows one domain, and their Baby and Business plan offer unlimited domains. Their shared hosting should be sufficient to run WordPress, or other software that can be installed using their 1-click app installer. All plans come with unlimited disk space and bandwidth. You can currently try out Hostgator Hosting for 1 cent when paying monthly, although after the first month if you wish to stay you might consider cancelling, and signing up again with one of the better long term discounts. However, if you have a business or high traffic website (100,000+ page views per month) you may wish to consider their cloud hosting which is a lot faster, and is relatively cheap for what you get, starting at $4.95 for a single domain. Furthermore, their cloud hosting comes with failover, meaning that if there is a hardware issue your site will be switched to another server. You can read more about the Hostgator plans here, or contact them with any queries on live chat. What payment types does HostGator accept? They accept credit cards, debit cards, PayPal, money orders, bank wires, Western Union and cash. If wishing to pay my money order, cheques, and even cash, then you can post this to them in the mail and it will be applied to your account. Can I pay for web hosting using PayPal? Yes, they accept payments from verified PayPal accounts. Unfortunately, they do not accept other third-party payment sites such as Moneybookers, WebMoney, or AlertPay. Hostgator does not currently accept Bitcoin. We recommend Namecheap if this is a requirement. What billing terms does HostGator offer? For their shared hosting they offer monthly, 3-monthly, 6-monthly, yearly, bi-annual, and tri-annual billing terms. Significant savings can be made if you sign up for longer. Is it worth paying for more than a year in advance? While it is much better value to pay for such a long period in advance, you have to consider that hosting providers can change considerably over that time. While they may be good today, doesn’t mean they will be in two years time. Furthermore, in a year, for example, you may wish to change provider to take advantage of new technologies or better support. Only you can decide, but you may wish to check out the Hostgator reviews before purchasing. While it is very easy to manage domain names with Hostgator with their simple control panel. You can also opt for Domain Privacy Protection to keep your details private in the WhoIs directory, which can reduce the amount of spam emails you receive. The domain pricing is comparable to most other hosting providers. However, compared to a specialist domain provider such as GoDaddy or Namecheap you will find it more slightly more expensive. You can find a detailed guide on how to purchase a domain with either GoDaddy or Namecheap and point it to your hosting provider here. It’s easy. Can I renew or extend my domain name with the promotional pricing? The domain name discount only applies to newly purchased domain names. It cannot be applied to renewals or transfers. According to section 15 of their Terms of Service, a 99.9% uptime guarantee is in place for their Shared and Reseller hosting plans. If they do not achieve this level of service they will add one month credit to your account. Note that planned maintenance does not count towards downtime. Their VPS and Dedicated Servers are covered by their Network Guarantee, which applies prorated credit for the period the network is down. Will HostGator help me upgrade to a VPS or dedicated hosting server? Yes. Just purchase a VPS Plan and fill out their transfer form and they will take care of it for you. Alternatively, just purchase the VPS, transfer your files and then point your domain name at the new server as per your welcome email. If you wish to migrate to a dedicated server, simply contact HostGator support and they will walk you through the whole process. How much does it cost to upgrade to WordPress managed hosting services? It is easy to upgrade to their WordPress Cloud plans which are fully managed, as they offer free migrations. It is based on their Cloud Hosting architecture and offers up to 2.5x load times, CDN, and multiple caching layers. 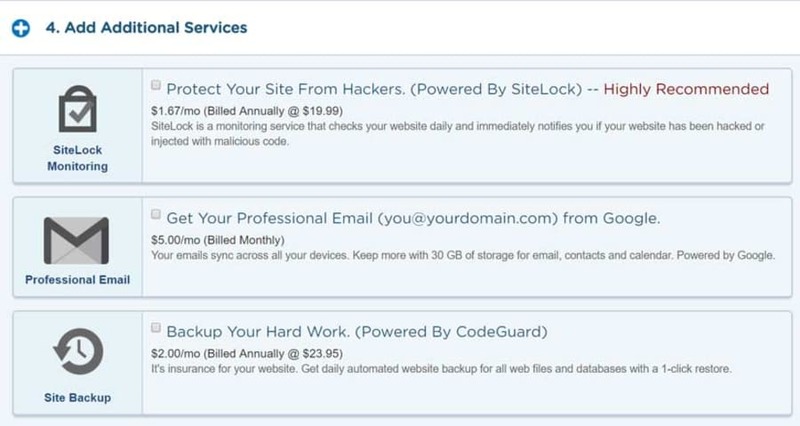 It includes automatic malware removal, Adwords credit, automatic updates to WordPress Core & WordPress plugins, site backup & restore with CodeGuard among other benefits. For a couple of extra dollars a month, this is definitely worth considering. Can I apply the discount coupon on orders made through the Customer Portal? If you are an existing customer can still get a discount on web hosting plans from HostGator by signing up directly from the sign up page. You can still link it to your account by logging in during the sign up process. Unfortunately, no discount will show on orders directly through the customer portal. Do I need a promo code to get discounted pricing on HostGator.com plans? Yes, but when you click the link above it will be automatically applied during the checkout process, and any prices will be reflected on the respective landing page. Are there any HostGator renewal coupon codes? Unfortunately, any discount on web hosting only applies to the first invoice. As such there is no HostGator coupon for renewal. However, there is nothing stopping you from signing up for a new account with another provider and transferring your website. Does the domain discount apply to transfers? The discount does not apply to transfers. Can existing customers take advantage of any HostGator deals? Yes! Current customers are welcome to join in and take advantage of this great offer; however, the offer is only applicable to newly created HostGator hosting plans. That means the discount does not apply to extensions, renewals or upgrades of existing hosting packages. Note that your plans on your existing hosting account cannot be canceled and transferred to a new package in order to receive the discount. If this occurs, you will be billed retroactively for the discounted amount. Yes. Customers receive a 45 day money back guarantee for shared hosting, Virtual Private Servers (VPS), and reseller hosting plans. Do they offer both Linux hosting and Windows hosting? Windows hosting comes with the Plesk control panel. Linux hosting comes with the cPanel control panel.